So, you say you just built a Facebook Fan Page and you Need more LIKES. Fan Pages are extremely important to a real estate agents business. The Fan Page gives an agent the opportunity to showcase their expertise in the market places they serve. Many would argue that agents should pay to obtain more LIKES on Facebook. However, in Real Estate the best Lead or LIKE is someone that loves you, likes you and would also refer you. Therefore, let’s start with the people we already know. In the digital arena this is called, “Organic Reach”. Below are 7 easy ways to generate “Organic Likes” on Facebook. 1. Take advantage of your list that is stored in your Multiple Listing Service. Many MLS’s allow agents to email directly to their database by category or to the entire list as a BCC (Blind Carbon Copy). If this isn’t available download your email list. Send a an email to this list asking for new LIKES on your Facebook business page. Keep it simple. Consider asking your database to help you reach your goal. The first time I tried this my email went something like this, “Help me reach my goal of 100 LIKES by July 1st”. From this email I had 100 LIKES in 24 hours. 2. Send an email from your CRM (Client Relationship Manager). Write a short update on your current Market Place and tell your database they can view these updates in real time when they “LIKE” your Fan Page. Wait, you’re not sending snail mail marketing? If you are focused and able to generate leads from social media then OK. Don’t send snail mail. For the rest of us that sell real estate, direct mail is necessary for personal branding. Add your Facebook URL to your direct mail marketing (post card) and ask people to join you on Facebook for market updates. 4. Create Video Content. Provide market insights, tip of the day, contests, surveys and more with video. Always ask for new LIKES on your Facebook Fan Page. 5. Add widgets/apps to Facebook. What’s a widget? A widget allows you to build tabs that are located below your Facebook banner. These widgets can redirect your followers to search for homes, build a “FREE” market report or access statistics. Click to Check out my page. 6. Invite your Facebook Friends to your Fan Page. Share relevant information from your Fan Page then re-share it to your personal page. Ask your friends to LIKE your Fan Page. I recommend that you do this, maybe, once a month depending on your friend count. If you only have 100 friends, don’t share from business to personal very often. Your friends will hide your posts. 7. The “Task is to Ask” if you’re not asking for LIKES then you won’t have many LIKES. Marketing is marketing. “When business is good it pays to advertise, when business is bad you’ve got to advertise” Henry Ford. Ask for your followers to LIKE you page today. What are you waiting for? Social Media Marketing takes time, consistency and work. Growing your Fan page might not happen over night. However, just like with any business you must START advertising to generate a following on social media. If the social world is unaware of your Fan Page then you can’t generate a lead. Take the next 7 days, 30 minutes a day, to work on these 7 tips. Share your results with me. If you need assistance send an email to RequestCarrie@gmail.com and we will have a #CoffeeWithCarrie session. Manage Instagram from your Hootsuite Dashboard. Hootsuite is one of the best ways to streamline your social media posts, schedule and watch the latest trends. Now that Instagram is available as one of your profile options, Real Estate agents can share their Instagram posts to multiple social media sites and help increase their Digital Footprint. If you already have Hootsuite for your business adding Instagram is quick and easy. 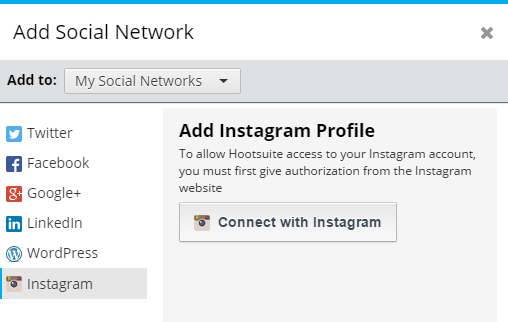 In order to take advantage of Instagram on Hootsuite you must have the app on your phone. Schedule your weekend marketing so you can take a day off. Real estate agents are always, “ON”. Therefore, by taking advantage of scheduled marketing an agent can work with customers and know that they are marketing their business to generate potential buyer and seller leads.